Clients wanted a ranch house that was not too rustic, but felt as though it still belonged on a ranch. They wanted a home that focused on outdoor living - the pool and outdoor kitchen were the primary importance, and they envisioned creating a setting where they could entertain friends and family. 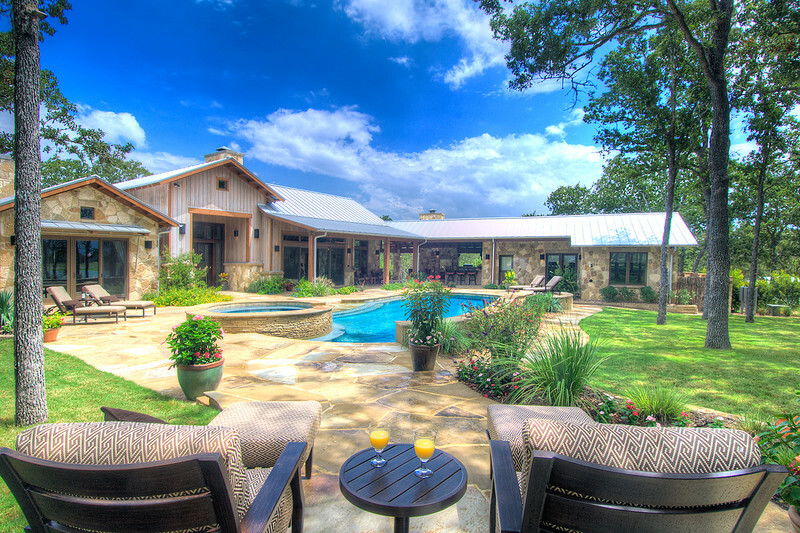 The home site is part of a 300 acre ranch near La Grange, Texas that Clients purchased a few years back. A metal barn was in place upon purchase, and they built a small house with the intention of it being a future guest house. The ranch has two lakes, rolling hills and stands of post oak trees. The house is located at their favorite spot on the ranch, and from this knoll, the house is oriented to view both lakes. A grove of post oak trees sits to the south of the home site. The design goal was to configure the house to orient in some way to the many site features. The direction of prevailing breeze, solar orientation, lake views, tree locations, topography, all shaped the floor plan in substantial ways. The design comprised of three elements – Main House that includes the master bedroom, Casita with two guest bedrooms, and Outdoor Kitchen/Living Space as a connector. Foyer was configured to create a direct view and pathway from the entry door to the pool deck. It also separates the master bedroom from the social and entertainment spaces. The living and dining areas were designed to enable substantial amounts of glass on the South and East walls in order to expand the views from within. Reclaimed barn wood was used extensively on the interior. Reclaimed sinker cypress was selected for the exterior siding. Limestone was used extensively on the exterior and interior. Mesquite flooring was placed throughout the primary living areas.